Dolly released her 38th solo album, “For God and Country” on Veterans Day in 2003. The album is a collection of patriotic songs which include famous tunes such as “The Star-Spangled Banner,” Lee Greenwood’s “God Bless the USA,” and “When Johnny Comes Marching Home.” Ten of the songs are written by Dolly and include, “Welcome Home,” “Red, White & Bluegrass,” and “Color Me America.” The album was released on Nov. 11, 2003, on the Welk Music Group label. 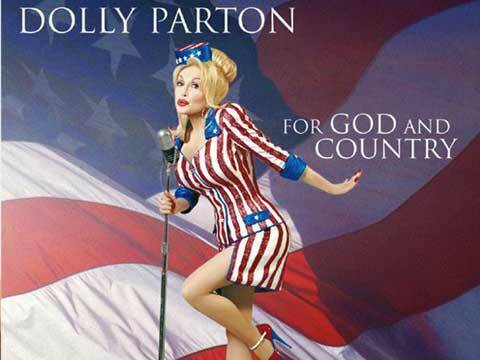 The album represents Dolly’s deep patriotism and spiritual beliefs. The album features a new version of Dolly’s beloved 1977 hit, “Light of a Clear Blue Morning.” The song, “Color Me America” is featured in the patriotic finale at Dolly’s Dixie Stampede Dinner Attraction in Pigeon Forge, Tenn. and Branson, Mo.